Ever wonder what the characters of Pride and Prejudice would be like if the book was set today? Ever wonder what their texting conversations would have looked like? Well, you’re in luck. Emoji Pride & Prejudice has dreamed up exactly that! Like this convo between Lizzy and Jane after the first Meryton Ball. 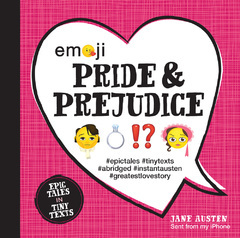 ICYMI, Jane Austen’s Pride and Prejudice told in texts and emojis. What would happen if the characters of Pride and Prejudice could text each other? Would Elizabeth call Mr. Darcy a [poop]? Would Darcy drink and dial and accidentally reveal his true feelings [heart]? In this laugh-out-loud re-telling of Jane Austen’s famous work, you’ll get a condensed modern interpretation of the world’s greatest love story . . . all told through texts and emojis. Featuring hundreds of classic and new emojis along with a removable poster (featuring all the emojis), this is the perfect gift for the Austen lover.